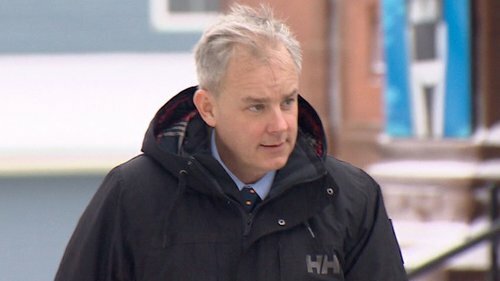 Dennis Oland's second-degree murder retrial in the 2011 bludgeoning death of his father Richard resumes in Saint John Tuesday when the Crown calls its next witness. Crown prosecutor Derek Weaver has a couple more questions for Dennis Oland's former manager John Travis on redirect. This "book of business" - would an investment adviser be able to just ask for payout? They can ask for it. Would they be able to get it that day? No. Next witness forensic accountant Eric Johnson. 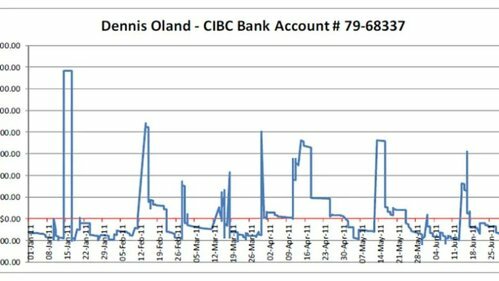 Johnson scoured Dennis Oland’s finances in the months before Richard Oland was murdered and compiled all the bank, credit card, investment and other transactions to develop a picture of Dennis’ financial situation. A slideshow presentation of Johnson's summary of Dennis' accounts is being displayed on a large monitor in the courtroom. Johnson is talking about Dennis Oland's main CIBC chequing account. Overdraft limit of $2 ,000. As of Jan. 1, 2011, account was overdrawn by $1 ,320.17, he says. Looking at breakdown of various sources of income Jan. 1-July 7, 2011. Total deposits = $102 ,835. Dennis Oland's murder retrial is back in session. 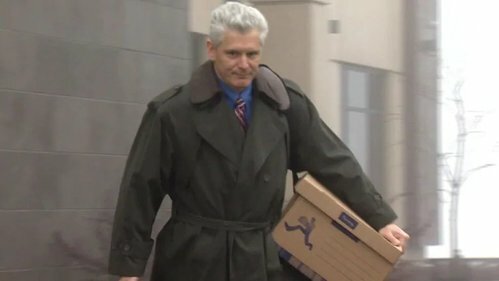 Crown prosecutor Derek Waver continues questioning forensic accountant Eric Johnson about his analysis of Oland's finances between Jan. 1, 2011 and July 7, 2011 - the day his father's body was discovered. Dennis Oland murder trial day #28 - afternoon session. In the witness box is forensic accountant Eric Johnson. 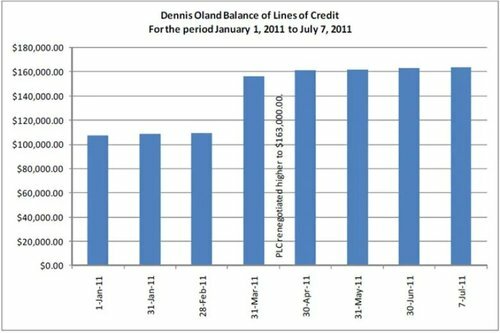 He’s reviewing various increases in Dennis Oland’s lines of credit. In February 2010 he expands a $15 ,000 line of credit to $35 ,000. In August 2010 he pays off the $35 ,000 line with a $75 ,000 line he opens that is secured against his house (collateral mortgage). In addition to the $35 ,000 line of credit, Oland pays $24 ,000 on his Visa and pays $5 ,000 to the Canada Revenue Agency. Within a month the $75 ,000 line of credit is up to $74 ,800. In March 2010 the $75 ,000 line of credit is expanded to $163 ,000. The Visa is back up to nearly $26 ,000 at this point and is paid off again. Johnson now talking about Oland's line of credit. Started in July/09 with $15K limit. Increased to $35K in Feb/10. Balance was transferred to a $75K line of credit, secured against his home in Rothesay in Aug/10. That collateral mortgage remained near its limit until it was renegotiated in March/11 to $163K , says Johnson. By mid May the balance on the new $163 ,000 line is up to nearly $162 ,000. On July 7, the day Richard Oland’s body is found it is $900 overdrawn. Within weeks, the balance reached $156K . By May, it was at $161K , June, $163K and on July 7, it was over by $939 .68, says Johnson. 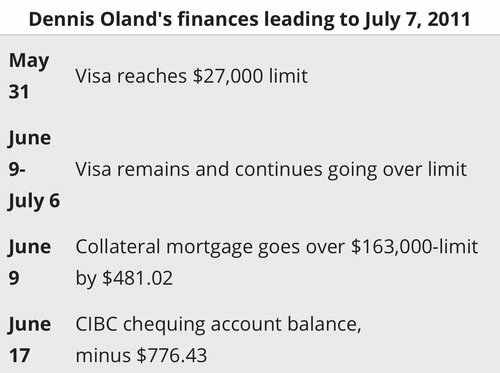 Despite Oland paying his Visa off for a second time in March 2011, the balance balloons again. On July 7, 2011, the credit card balance hits $31 ,210 - $4 ,100 over its $27 ,000 limit. For reference the murder is on July 6 and Richard Oland’s body is found the morning of July 7. Johnson now moving on to discussing Oland’s spending patterns in the months prior to the murder. Johnson says between January 1 and July 7 2011, Dennis Oland spent something more than $120 ,000 against income of less than $40 ,000. Spending was outpacing income by about $14 ,000 per month. Johnson’s analysis shows Oland spent more than $20 ,000 on three separate personal trips between November 2010 and May 2011, including 23 days in Hungary and Italy, 18 days in England and 12 days in Florida. Between Nov/10 and May/11, Johnson found foreign currency transactions on Oland's Visa totalling about $20K for apparent trips to Hungary (23 days), Florida (12 days) and England (18 days). 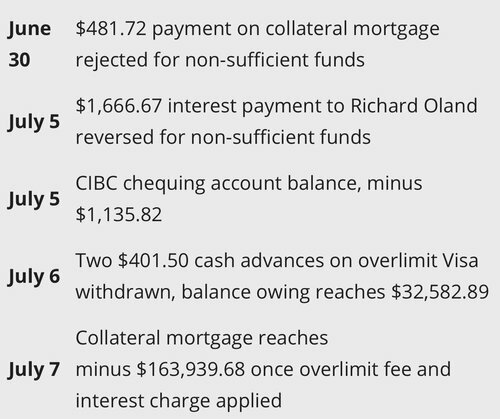 Dennis Oland’s chequing account, Visa and line of credit are a combined $7 ,600 overdrawn or over limit among the three of them by July 7. On top of that a $1 ,666 cheque to Richard Oland has bounced and needs to be reissued. Crown prosecutor Derek Weaver tells Justice Terrence Morrison he's about to start asking forensic accountant Eric Johnson about a different issue. Suggests this might be a good time for court to take its afternoon break. Judge asks him to push ahead. Crown prosecutor Derek Weaver now attempting to show Oland was well aware of his financial situation. Weaver shows court an email Oland sent to his wife in late May telling her he had little credit left. "Hi, there is no money on my Visa card anymore so don't bother trying to use it," Oland told his wife in the May 31, 2011 communication. For some reason, however, Oland’s credit card still worked despite being maxed out and he continued to coax money from it. There were $100 cash advances on July 1, July 2 and July 3 and then $800 on July 6 records show.